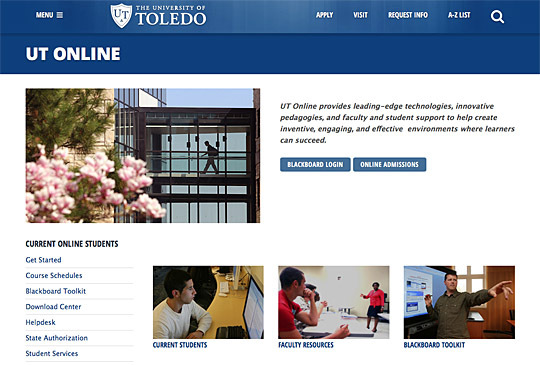 The University of Toledo continues to earn accolades for its online courses. Jessica Kruger, a UT doctoral student in health education, teaches three classes that have been recognized by Quality Matters, a peer review process that certifies the design of online and blended courses. • HEAL 1310: Nutrition for Fitness and Health, which is for all majors and teaches foundational knowledge of nutrition. • HEAL 1360: Alcohol and Contemporary Issues in College, which focuses on the effects alcohol can have on college students. • HEAL 3300: Drug Awareness, which teaches everything about drugs, legal and illegal, good and bad. “It is important to make sure courses are meeting a standard, include more rigorous work, and focus on the student,” Kruger said. Kruger said programs like Quality Matters are important because instructors can take what the QM peer review team suggests and improve the course being taught. Kruger believes distance learning is important because it is a great way to provide students with more flexibility; however, it requires strong self-discipline. Faculty who would like to learn more about Quality Matters or the course review process are encouraged to contact Phoebe Ballard, director of instructional design and development, at phoebe.ballard@utoledo.edu or 419.530.4379. Faculty can now bring the library into the Blackboard classroom with a new tool, the UTMOST Curriculum Builder, creating an innovative and convenient way for students to access online library resources. UTMOST Curriculum Builder is available now from the Tools menu option in Blackboard. When added to a course, UTMOST Curriculum Builder provides an in-course search box for library resources. Search by keyword, author or title. Items from the search can be added to the course and are visible to students as a reading list. Faculty can create annotated reading lists for assignments with instructions and PDF links. Students can click through to full text. For step-by-step information on how to add UTMOST Curriculum Builder to a Blackboard course, faculty can click here. Questions about the UTMOST Curriculum Builder can be directed to Elaine Reeves, associate lecturer and online learning librarian at Carlson Library, at elaine.reeves@utoledo.edu or 419.530.2868. The University of Toledo recently was selected as one of America’s Outstanding Navy Reserve Employers for 2016. More than 100 employers were nominated for this recognition; 50 were chosen, and UT was the only higher education institution selected to receive this designation. Navy Reserve Lt. Haraz N. Ghanbari, director of military and veteran affairs, nominated the University for the honor. Ghanbari is working to create and implement a training program option for University employees that will increase awareness of what veterans have gone through and what they face when they return home. His goal is to improve the experience of veterans transitioning from deployment back into their civilian lives, whether they’re a student or a member of the faculty, staff or administration. The training program is modeled off the Green Zone training program used at colleges across the country. It also will highlight what a great resource student veterans are for the University. In 2015, UT was a recipient of the Employer Support of the Guard and Reserve’s Seven Seals Award, and in 2016 it was ranked No. 157 on the USA Today and College Factual’s Best Colleges for Veterans list. The University has received recognition as a top military-friendly school from Military Times, Military Advanced Education & Transition, and G.I. Jobs thanks to UT’s military-supportive culture and the numerous resources available on campus and locally in Toledo, such as the Military Service Center on campus and the Lucas County Veterans Service Commission. UT also hosts various events throughout the year to recognize and assist local veterans. In March, for example, the Veterans’ Business Forum invited veteran business owners and entrepreneurs to campus to network with and hear from local business and government representatives and gain access to business resources. The community’s annual Veterans Appreciation Breakfast and Resource Fair on Veterans Day takes place at UT, and the Veterans’ Plaza, located on the northwest corner of Centennial Mall on Main Campus, recognizes the courage and commitment made by servicemen and women. Dr. Barbara Kopp Miller, associate provost for online education, will represent UT at the Navy Reserve’s 2016 Navy Employer Recognition Event June 24 in Norfolk, Va. The Ohio Quality Matters Consortium’s Fourth Annual Member Meeting will be hosted by UT Online at The University of Toledo Thursday, May 12, from 8:30 a.m. to 3:30 p.m. The meeting will be held in the Student Union Ingman Room and will kick off with a continental breakfast and welcome by UT President Sharon L. Gaber. Hosting the event on UT’s campus serves as a way for the University to support the Ohio Consortium and Quality Matters’ continued implementation throughout the state, said Dr. Barbara Kopp Miller, associate provost for online education. “We felt that the event would make for a unique and engaging way to showcase the benefits of the Quality Matters program to UT faculty,” she said. Quality Matters, a faculty-centered, peer review process designed to ensure quality in online and blended courses, was first adopted by the University in 2011. Since then, 12 UT courses have received official Quality Matters recognition, and 16 UT faculty members have become certified to serve as Quality Matters peer reviewers. Throughout each academic year, UT Online awards professional development grants for experienced online instructors to complete the Peer Reviewer Course and serve on official Quality Matters review teams. This year’s meeting theme is “QM: The Heart of It All,” and the event will include hands-on sessions and opportunities to network with colleagues and peers from across the state. Quality Matters-related research opportunities, faculty development initiatives, online accessibility, instructional strategies for learner interaction and engagement, and competency-based education will be topics of discussion at the meeting. The Annual Member Meeting is free to attend for all Ohio QM Consortium members, including UT faculty. Event registration is open through Monday, May 2, and can be accessed online at https://ohioqm2016.eventbrite.com. For more information about the event, the course review process, or the professional development grant, contact Phoebe Ballard, director of instructional design and development, at phoebe.ballard@utoledo.edu or 419.530.4379. Teachers interested in learning about open educational resources and other technology advancements for their classrooms are invited to participate in a free conference at The University of Toledo. The Open Educational Resources: Active Learning and Technology Conference will be held Wednesday, April 27, from 8 a.m. to 3:15 p.m. in the Radisson Hotel Grand Ballroom on the UT Health Science Campus. “High school and college teachers will have the opportunity to come together to learn about some of the latest trends in classroom technology and how they can incorporate these into their lessons to engage their students,” said Dr. Barbara Kopp Miller, UT associate provost for online education. Other topics throughout the day will include embracing technology for personalized teaching, the Evaluating Digital Content for Instructional and Teaching Excellence learning project, the INFOhio digital library resource, tools to engage students, and legislative and regulatory issues. Register by Monday, April 25, to attend the conference co-hosted by UT Online and the University Teaching Center at tinyurl.com/UTALT2016. UT Online recently recognized three employees for their outstanding contributions to The University’s online learning services. The first award, named for Dr. Ella Fridman, who was one of the first UT faculty members to convert her courses to online versions, was presented to Barbara Mauter, adjunct instructor in the College of Adult and Lifelong Learning. “[Mauter] should be recognized as an excellent example of what being an online instructor truly means. She is dedicated to quality and student engagement, and continues to be a strong faculty advocate for all of UT Online’s services,” wrote a nominator. 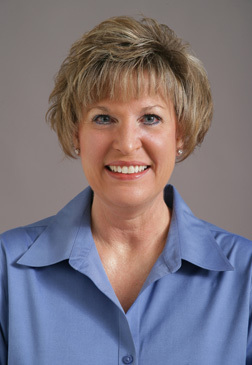 Mauter began teaching at The University of Toledo in 2007 and taught her first online course in 2010. She has written two of her own courses and is in the process of creating a third. Mauter was the first faculty member to complete the Pathway to Master Online Instructor program. “I enjoy what I do. Maybe that’s it. I enjoy working with the students,” Mauter said when asked what she believes has made her so successful. The second honor presented was the DiAnne M. Masztak Award, given annually to a UT community member who has supported online learning in a distinguished fashion and gone above and beyond his or her duties to provide exemplary service to students, faculty and the UT community. This award went to Dr. Ruthie Kucharewski, professor and director of the Recreation Therapy Program in the College of Health Sciences. She was called “an endless advocate for online education and UT Online” by her nominator. 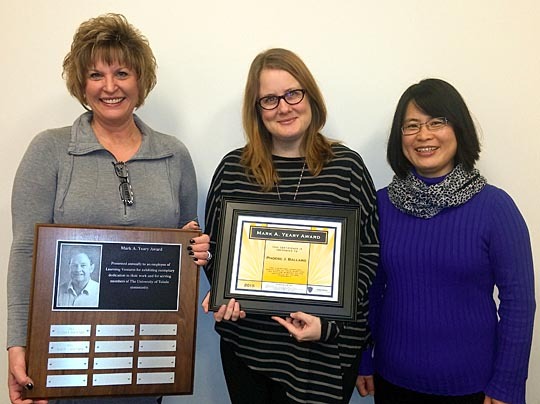 Phoebe Ballard, director of instructional design and development, center, showed off the Mark A. Yeary Award she was presented by Dr. Barbara Kopp Miller, associate provost for online education, who held the plaque where Ballard’s name was added, and Dr. Mingli Xiao, senior instructional designer. “I try to improve my skills and educate myself [about online learning] more all the time and connect with other online faculty so that my classes are interactive, interesting, designed well, and have good content,” said Kucharewski, who has worked at the University since 1997. UT Online’s Mark A. Yeary Award was named in recognition of the man who worked at the University 23 years. During his time at UT, Yeary’s dedication to the distance learning program contributed greatly to the development of the largest distance learning program in Ohio here at UT. The winner of this award was Phoebe Ballard, director of instructional design and development. 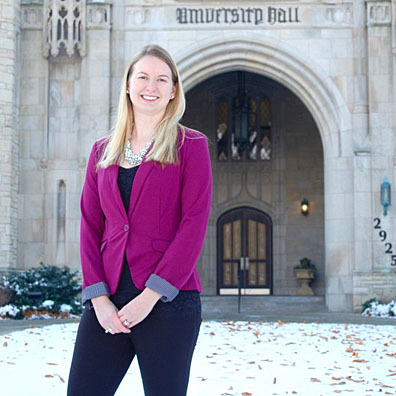 Since, 2003, Ballard has worked in UT’s Online learning division, and in her spare time, she teaches at the University, serves on the board of directors for The Independent Collegian, and is an adviser for the Student Media Association. “This award is extremely important to me because it came from my peers. They inspire me and challenge me daily, and I am very proud to be a member of this dedicated group,” Ballard said.